Stopping chronic diseases before they start adds decades to life. Years of living well, not living sick. Enjoy life! Smoking is the leading cause of preventable death in the United States. More than 480,000 people die each year in the United States as the result of tobacco use. Smoking causes cancer, heart disease, stroke, lung diseases, diabetes, and chronic obstructive pulmonary disease (COPD), which includes emphysema and chronic bronchitis. There are many initiatives and resources in Johnson County working hard to help people quit and to ensure our youth population never starts. Kansas Tobacco Quitline – Quitting tobacco is one of the best things you can do for your health. The Kansas Tobacco Quitline provides FREE one-on-one coaching for Kansans ready to quit using any form of tobacco. Designed to help the tobacco user take control of his/her attempt to quit, Quitline is available 24 hours a day/7 days a week online and by phone, text or mobile application. Trained Quit Coaches provide participants support to create an individual plan to quit tobacco and fight cravings. Smoke-Free Housing – Are you looking for an apartment in Johnson County and want to find a complex that is completely smoke-free? Are you a landlord and thinking about adopting a smoke-free policy at your property? Visit our website for a list of smoke-free residences in Johnson County. Tobacco 21 Initiative – The Kansas City metro area is a leader in the efforts to reduce teen vaping and tobacco use through Tobacco 21 policies. Since, 2015 more than 28 jurisdictions in the Kansas City area have raised the age of sale for vaping and tobacco products to 21. More than 1.5 million residents in the metro area now live in cities or jurisdictions with Tobacco 21 policies. 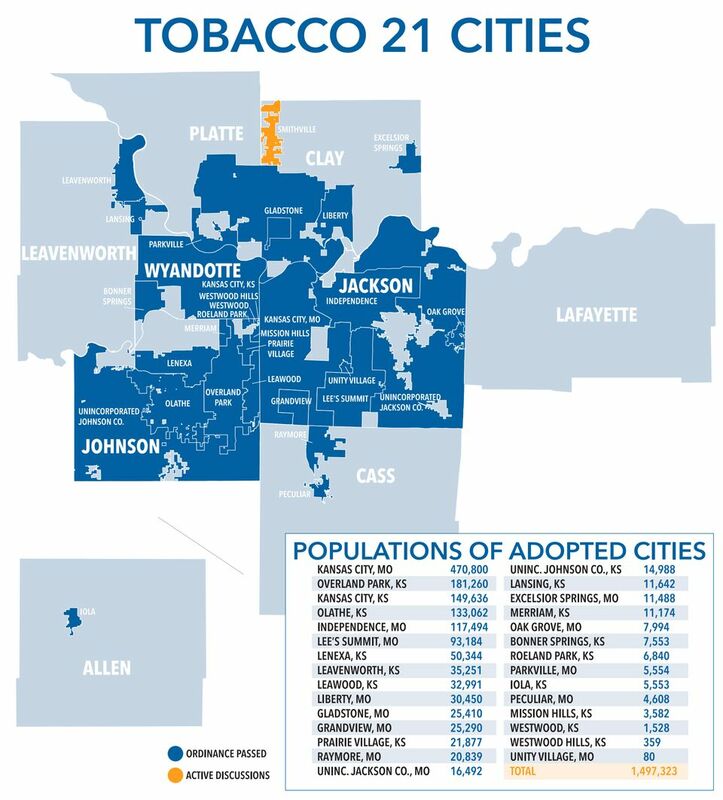 In Johnson County, 12 jurisdictions have passed Tobacco 21 policies which cover more than 458,000 residents. Brief Tobacco Training – This online training will teach you how to effectively talk to your patients about tobacco in less than 3 minutes. Also learn about the free, state-of-the-art tobacco cessation service called the Kansas Tobacco Quitline. CEU’s are approved for dentists, dental hygienists, physicians assistants, doctors of medicine and surgery, osteopathic medicine and surgery, chiropractic medicine and naturopathic medicine. Kansas Tobacco Quitline – The Kansas Tobacco Quitline provides FREE one-on-one coaching for Kansans ready to quit using any form of tobacco. There are several resources available to healthcare providers to help their patients quit. Heart Disease: What Can You Do To Prevent It?